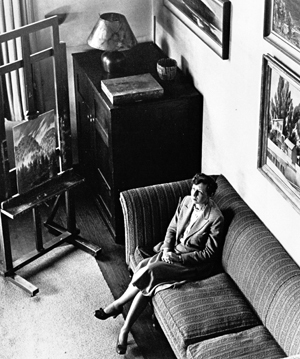 For over sixty years, Alison Mason Kingsbury made Ithaca her home and artistic muse. She was a dedicated twentieth century artist, when to be such with any seriousness as a women in Central New York was a true challenge. And serious she was, producing a remarkable body of work, ranging from commissioned murals to grand regionalist depictions of the Finger Lakes area to small abstract collages. A. M. K. was an active member of the Cornell Community through her husband, renowned Romance languages professor Morris Bishop, and her own energetic engagement in forwarding artistic activity on campus through exhibitions and lectures. Cornell University Library remembers this late artist through an exhibition of the Division of Rare Book and Manuscripts' Alison Mason Kingsbury Collection, held in conjunction with the publication of the book The Art & Life of Alison Mason Kingsbury by Jillian Piccirilli ('08) and the launch of the image database of Alison Mason Kingsbury's artwork. Photograph courtesy of The History Center in Tompkins County.